Many foreign buyers of property in Italy are smitten by Italy’s illustrious building history. Italians are great architects, and they’ve been making beautiful, well-constructed houses for centuries. So even a 400-year-old farmhouse out in the wilds is likely to be handsomely crafted and full of charming details. Umpteen thousands of foreign buyers have bought old homes in Italy. They either restore the property themselves, making good use of Italy’s excellent builders and craftspeople, or buy a property which someone else has already lovingly restored. But what of modern and new-build homes in Italy? These are also popular with foreign buyers, and rightly so. 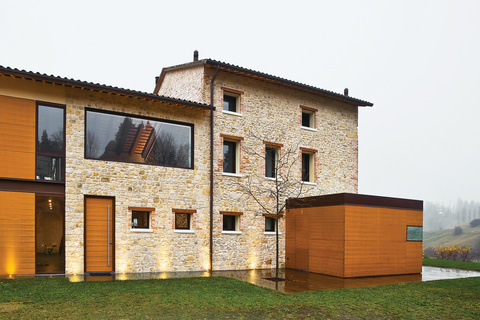 The Italian tradition of building well persists to the present day, and a modern home need not be a bland or characterless home by comparison with a centuries-old villa, townhouse or farmhouse. Modern homes have some distinct advantages over older ones, as well as a few disadvantages. Let’s look more closely at the latter and then move on to the former. Italians themselves usually prefer modern-built homes over old ones as places to move to, so as a property-hunter you’ll be competing with Italian natives as well as other foreign buyers. With more buyers competing for them, modern-built homes can be higher-priced than older homes. And that’s also true because they’re more likely to be in popular locations than older properties. Beachfront and lakeside homes are predominantly modern, for example, as are homes in places with lots of employment prospects. But unless you’re someone who can’t help hankering after a home full of history, period features and so on, there are clear advantages to buying a modern-built property. Firstly, you can start using it from the moment you’ve bought it. There’s no waiting to have it restored or refurbished. Everything inside should be in good working order and up to modern standard: electricity, plumbing, etc. Modern earthquake-proofing will already be inbuilt to meet current legal requirements. Insulation and energy-efficiency will have been addressed. Worries about the costs of maintenance and upkeep are significantly lower with modern-built homes than old ones. Two types of new-builds that deserve special mention here are off-plan purchases and self-builds. Buying off-plan can be a bit nerve-wracking because you’re committing to something that hasn’t even been built yet, but the reward for this bit of uncertainty is usually a considerable saving on price. Off-plan purchases can prove a very wise decision in terms of value-for-money. And such buildings are very often in desirable places such as seaside locations. Self-builders, meanwhile, are potentially able to enjoy enormous advantages. They buy land in a location they like, and then get to construct precisely the home they want facing the right direction, internally laid out exactly as they wish, externally styled historically if desired, and incorporating all state-of-the-art electrics, plumbing, heating, energy-saving techniques and so on. They even usually get to spend less than would a buyer of a similar but ready-built home. With Italy’s great legacy of beautiful old buildings and its high standards of modern home-construction, you can very safely choose old or new when buying property in Italy. All you need to do is decide which kind you prefer.